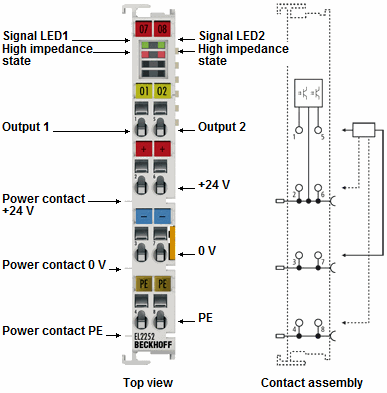 The EL2252 digital output terminal connects the binary control output signals at the process level with electrical isolation. The outputs are switched precisely synchronised with the transferred time stamp, which has a resolution of 10 ns. This technology enables output switching times to be specified precisely across the system. The distributed clocks are used for reference. In conjunction with the EL1252 (digital input terminal with time stamp), the EL2252 enables responses with equidistant time intervals, largely independent of the bus cycle time. Each output can be switched to high resistance individually. Special features Outputs can be connected in high-resistance mode, short-circuit-proof.